They all had their 'something blue' sorted anyway! Anyone who's ever dreamed of a white wedding found out exactly what it takes to make it happen this week - and sure enough, the picture-postcard winter wonderland is no mean feat. But thankfully, some happy (and lucky) couples around the country managed to defy the odds and tie the knot - with a little help from their friends. 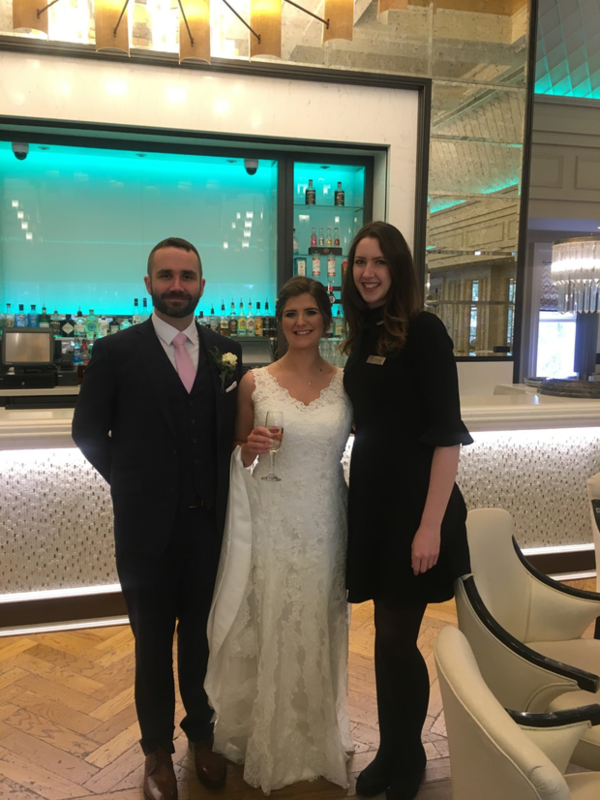 Stephanie Byrne from Arklow and Damien Cullen from Carnew (above) tied the knot on Friday 2nd March and held their reception in the Arklow Bay Hotel. 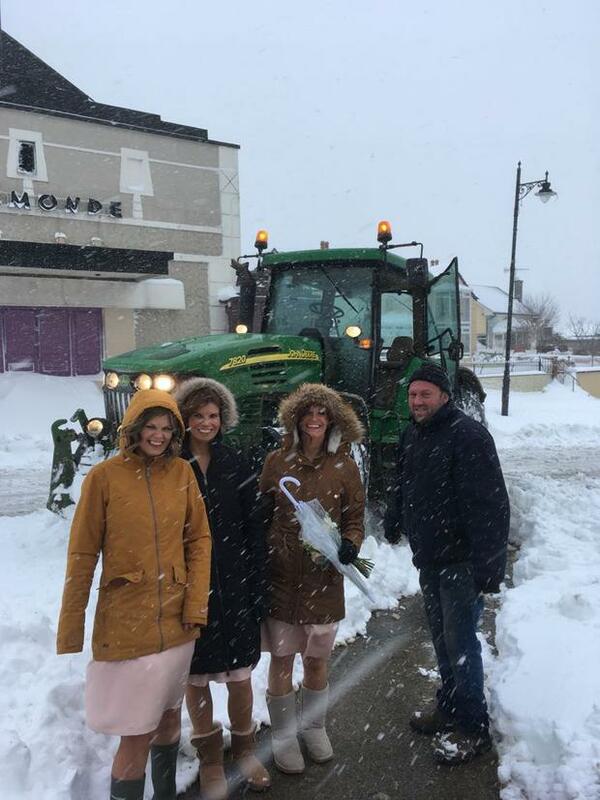 The bridal party only managed to get to the church by tractor - graciously provided by locals in the area. It made for a rather 'bumpy ride' to the aisle! 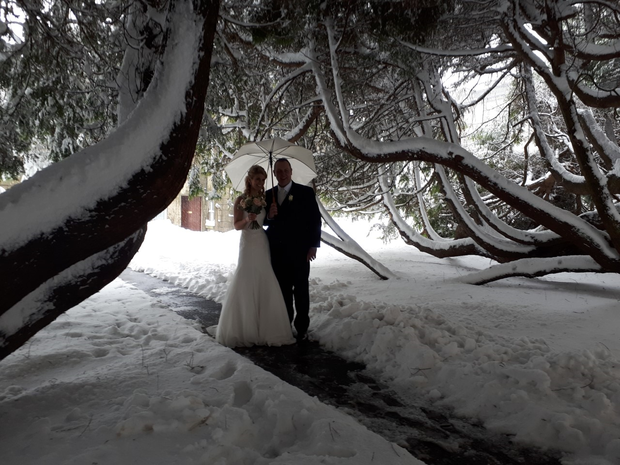 "Stephanie was heartbroken not all the guests could travel," her sister Lorraine told THEVOW.ie, "but she's having a lovely day so far considering! 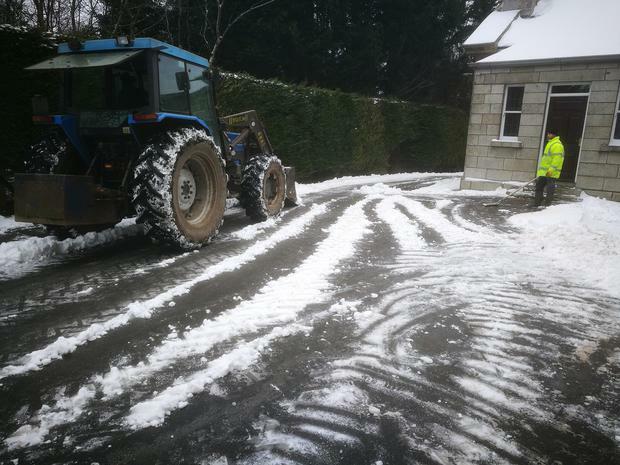 Thanks to the locals for the dig out!" After their original venue cancelled, Elizabeth and Conor Blaney were given 24 hours to rearrange their entire wedding. They did, and tied the knot today with the help of wedding coordinator Laura Patterson of the Galgorm Resort & Spa. Laura was happy to see the couple's dream come true at last. They'll spend the weekend being pampered at the resort! 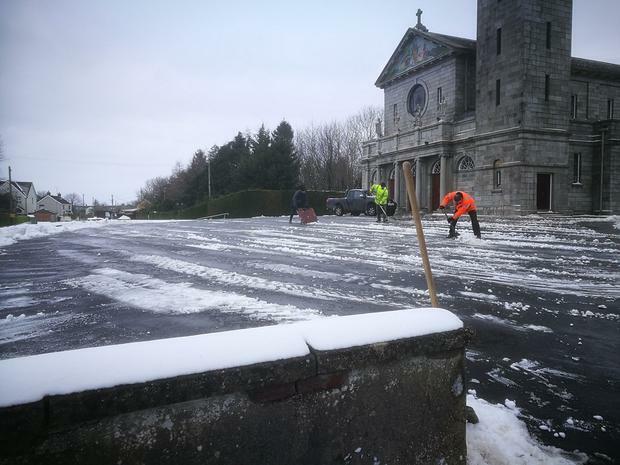 Armagh couple Lisa and Dean from Middletown managed to make it to the church on time with the help of an entire community who pulled together to clear the roads on the way to the church from the early hours of the morning - along with the groom and the best man! 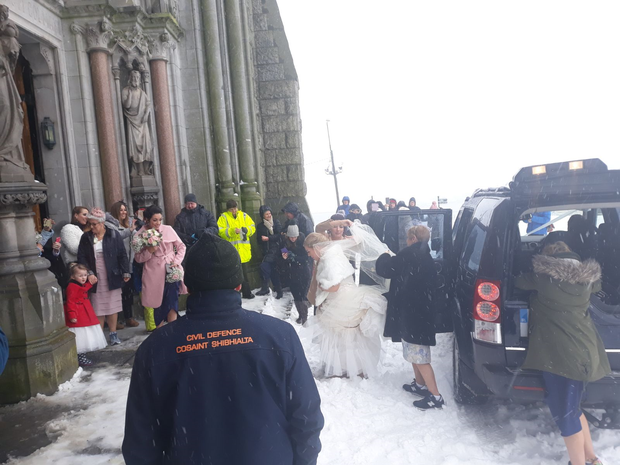 "Everybody was keen to help out on a big day like that," Aidan Murphy, Chairperson of the Glassdrummond Community Group told THEVOW.ie, "we were only a small part of that, there were several other famers from the local area who came out and did the roads for three or four miles to get people to the wedding." Aidan was delighted to see the community spirit for the day - as were the couple! Lisa and Dean managed to head off after they said their I Dos to the Four Seasons in Monaghan. "This area is built on community spirit, we're very lucky," said Aidan. 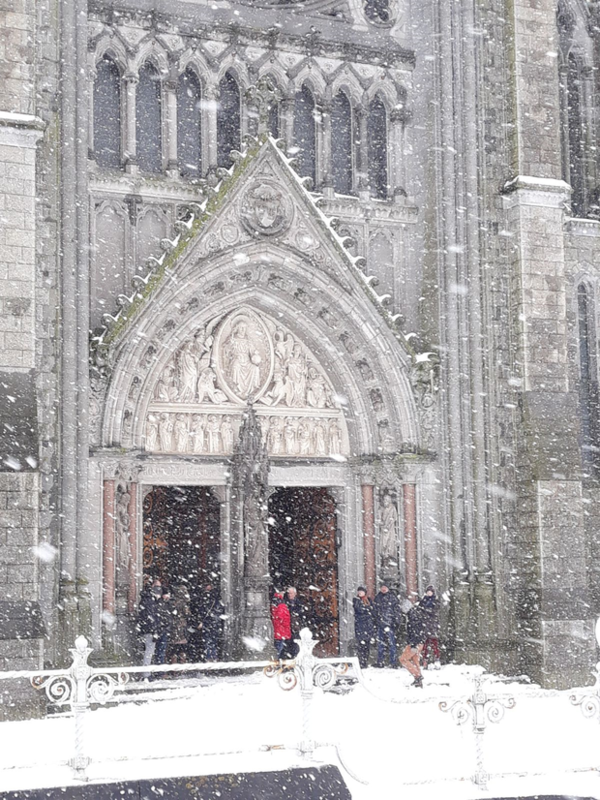 Laura McDonagh makes it to Cobh Cathedral for her wedding despite heavy snow and great island on lockdown! 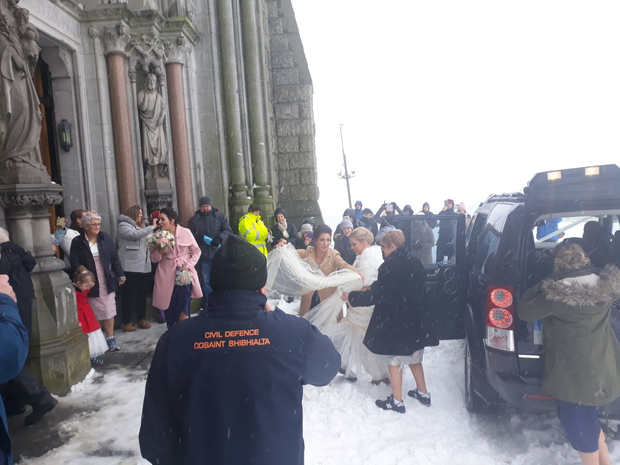 Her sister Lisa appealed for assistance getting the wedding party to the church on Thursday's Cork's 96fm Opinion line, and 'local hero' Gus Tennant stepped in to help with his 4x4, helping collect flowers, mother of the bride and the bridal party before bringing them to the church.